Philadelphia: S. Augustus Mitchell, 1846. unbound. Map. Lithograph with original hand coloring. 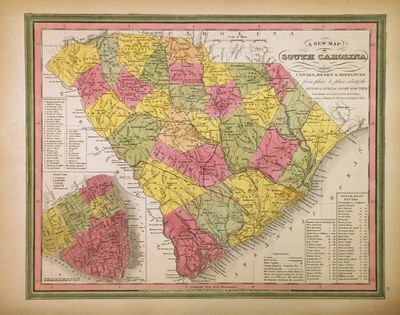 Image measures 11 1/4" x 14 1/4" Beautifully detailed first edition map of South Carolina divided into counties. The map delineates towns, waterways, railroads, and major routes, as explained in a small key at the bottom right. Canals are highlighted in blue and railroads in orange. Also included are insets of Charleston and a table of distances. The map is in good condition, with margin toning and a small chips along the edges. Large tear over margin, not affecting printed image. Samuel Augustus Mitchell Sr. (1792-1868) published this map as part of the 1846 edition of his seminal New Universal Atlas. Mitchell is one of the pioneers in American cartography of the 19th century and led the conversion of engraved map plates to more affordable lithographic plates.